Baan Leelavadee is situated on a hilltop within the exclusive Santi Thani estate, nearby the Santiburi championship golf club. 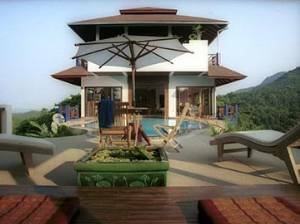 The private estate is the largest and most spacious private villa development on Koh Samui, with well-established and landscaped grounds, and guarded security gates. 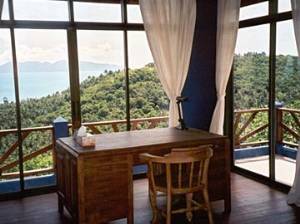 Baan Leelavadee is an ideal hideaway, with a dominating hilltop position offering spectacular 360-degree views, which the property has been designed to maximize. 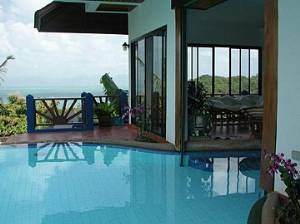 The breathtaking ocean views include most of the north coast of the island, with a backdrop of tropical forested mountains. Large steel gates, festooned with woodcarvings separate the tropical gardens of Baan Leelavadee from the main estate, with a driveway leading up to a huge carport. The ground floor of the rental home consists of two exceptionally spacious self contained triple bedrooms, each en-suite, and featuring individual air conditioning, ceiling fans, direct garden access through sliding glass doors, large built in wardrobes, coffee table and armchairs, writing bureau and chair, large double bed, additional single bed, and cool terracotta flooring. En-suite bathrooms are generously proportioned, with open showers. The two ground floor bedrooms have private access, and flank the north and south sides of the villa, with ocean views and mountain views respectively. Between the bedrooms is the main entrance to the property, with enormous, ornately carved double doors leading into the lobby. A polished hardwood staircase leads up from the lobby to the first floor, which is a vast, light, and airy living room. Sliding glass walls open to the balcony that envelops three sides of the floor, allowing the fresh mountain air to flow through the house. The west side of the living room meets the garden and swimming pool, with a built in Jacuzzi extending into the room. 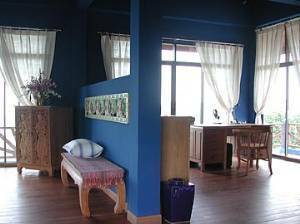 The living floor is well equipped and comfortable, decorated with Thai woodcarvings, and high quality furnishings. A wooden dining table seats six, and there are two casual sitting areas with armchairs and coffee table, and a set of cushioned coracles. The Swiss owner of the villa is a restaurateur, and the open plan kitchen is fully equipped, with a breakfast bar separating it from the living room. Adjacent to the kitchen is a further bathroom with a shower. The entertainment suite in the living room features 56 channel satellite TV, VCD, and stereo system. The second floor consists of an enormous master suite, reached by a polished hardwood staircase. Echoing the glass walled airiness of the first floor, this room is even more spacious due to the wood paneled vaulted ceiling. Balconies surround the floor, with a huge open-air bathroom located above the pool, with 180 degree views, an open shower, and a large bathtub surrounded by tropical plants and flowers. The polished hardwood floored suite features a King sized bed with romantic mosquito net drapes, coffee table and arm chairs, decorative wood carvings, ceiling fans and air conditioning, ample built in wardrobes, and a large study area with a writing desk. 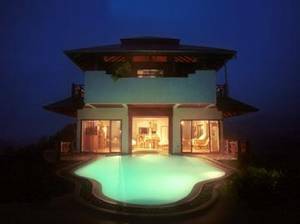 The pool is surrounded by a stone patio, with the main deck on the far side of the house, where a traditional Thai wooden pavilion, or sala, provides a shaded alternative to the sun deck. Four wooden loungers and a table with seating for four are provided for poolside relaxation. 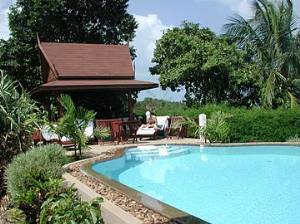 The mature tropical gardens include numerous cashew trees, palms, frangipani, and a myriad of plants and flowers.